alaTest has collected and analyzed 53 reviews of PANASONIC TX49EX600B. The average rating for this product is 4.8/5, compared to an average rating of 4.6/5 for other products in the same category for all reviews. Opinions about the design and price are overall positive. The sound and usability also get good feedback, whereas some have doubts about the reliability and glare. There are some mixed views about the remote control. We analyzed user and expert ratings, product age and more factors. Compared to other products in the same category the PANASONIC TX49EX600B is awarded an overall alaScore™ of 89/100 = Very good quality. Excellent Picture Quality Great TV. I bought this product last month and am extremely happy that I did! It has to be one of the best TV's available for the price! Thoroughly recommend and appreciate the 6 year guarantee! Bought this tv a couple of weeks ago. The menu is so easy, picture quality fantastic and even sound is so much better than I expected. 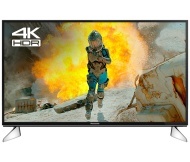 Had this TV for a week now and everything is fine, matched it with a Panasonic pvr sound and all aspects of picture are excellent, really easy to set up and remote control is simple and well laid out. Gt features, good picture, good sound. Great TV. This was really easy to set up. I cannot fault this TV at all.